The Little Mermaid animated film produced by Walt Disney Feature Animation is based on the Hans Christian Andersen fairy tale of the same name. 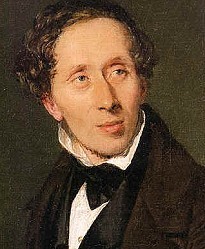 Hans Christian Andersen was born at Odense in Demark on 2 April 1805. He wanted to be an actor and a singer but eventually became an author. Why is Hans Christian Andersen famous? He is famous for the fairy tales he wrote. In his lifetime, he wrote more than one hundred and fifty fairy tales, and his stories have been translated into over 100 languages! His stories include 'The Ugly Duckling', 'The Snow Queen', 'The Little Matchgirl', and 'The Little Mermaid'. What makes a story a fairy tale? Fairy tales contain elements of magic, wonder, and enchantment.